I don’t have any other colour in my stash quite like Banana Special Odd (this is what I’m calling this colour as I don’t actually know what it is). It’s a gorgeous soft opaque pastel yellow glass that was made by Vetrofond. My lot of this glass has been tagged “Banana Yellow” with no code. For the longest time I thought I had the yellow glass with the brownish grey streaks in it (VF992). I was kicking myself for buying it because I thought that glass was ugly. I was making “zombie toe” beads and needed a “gross” glass colour to look like festering flesh. Finally, a use for that Banana Yellow! Except that when I got it to the flame no matter how much I worked it, no grey streaks appeared! So I cleverly deduced (look at my Sherlock skills) that I could not have VF992 “Banana Yellow” glass. Watson, my lot of yellow glass is tagged incorrectly. This led me to try and find out what I actually had and I thought I might as well write up the testing for it too. Effetre Opal Yellow struck, Vetrofond Banana Special Odd (not etched), Effetre Opal Yellow not struck. Since I trust the supplier I purchased the glass from, it seemed to me that the glass was probably another Vetrofond “Banana” colour. Vetrofond produced a lot of yellow colours in a short period of time during 2007 and a lot of the colours had similar names or names changed slightly when another yellow was created. After searching the internet for something to compare, I’m pretty sure what I’m working with is definitely a VF variant of Banana Cream, but that’s as close as I could figure out. Frantz Art Glass was Vetrofond’s biggest distributor for rods as they had to order the full melt for a rod pull. Frantz used to carry very large quantities of VF glass. They were in the habit of renaming colours that had a variance in a batch and this colour may be from such a variance, which is why it has been impossible to find a code or a proper name for it. The glass I have is definitely not VF992 Banana Yellow and if it is VF948 Banana Cream, then its a variation that is lighter. My rods are slightly grainy to the touch and stay the same colour as the rod when melted. My batch is not streaky, but can be struck to a true ripe banana colour, however its not as dark as other batches of Banana Cream I’ve seen. If you have a batch that sounds like this (and a few people have already contacting me saying that they have) enjoy it, because I don’t think anymore of it exists. 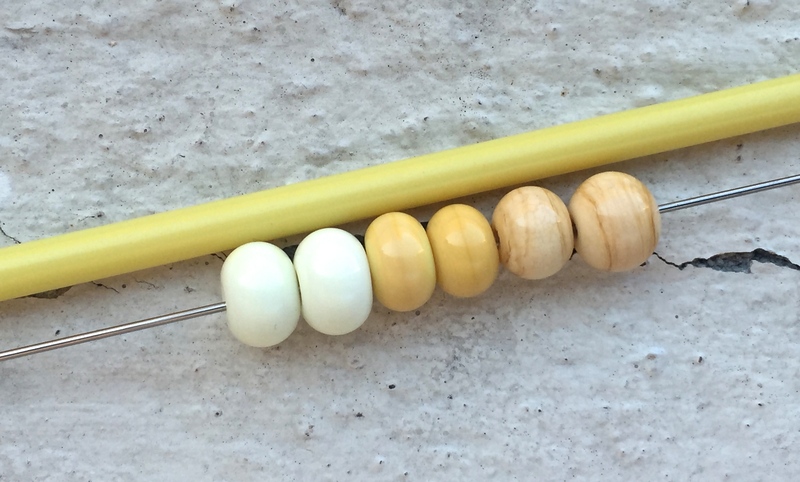 A rod of Vetrofond Banana Yellow Odd against beads going from left to right. Unstruck Effetre Opal Yellow, Struck Effetre Opal Yellow, Effetre Dark Ivory. Banana Special Odd looks the same in the rod as it does in a bead. I’d been staring at this colour for years now, not quite sure what to do with it as yellow is a colour I hardly use (and I thought I had VF Banana Yellow). Well, it turns out that Banana Special Odd is really a very beautiful colour. Not only is it a gorgeous creamy yellow, it is also supremely good to work with. It isn’t soft and it’s not too stiff either, it’s great for sculptural work as it doesn’t cool down too quickly and small details are very visible. It doesn’t ping or crack, as long as you heat your rod up a little first (no random breaking in the middle of the rod like Effetre Opal Yellow) and it doesn’t scum or bubble up the moment you drop it into your flame. 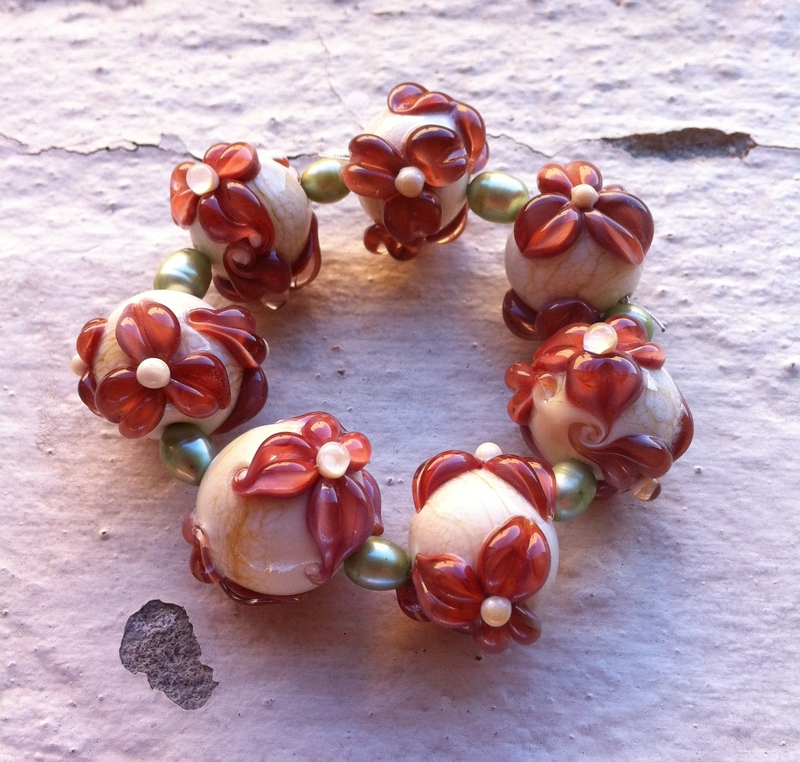 A bead made with a rod of Vetrofond Banana Special Odd. Demonstrating that the glass looks exactly the same as the rod. The blue dots are CiM Celadon covered with CiM Cirrus. The “greyish” little dots are CiM Cirrus. Celadon and Banana Special Odd has a dark brown reaction line where the two meet. Banana Special Odd is a pale banana yellow that looks brighter under fluorescent lights (all my photographs are shot in daylight). The rod and the finished bead look the same, although it can be struck to a ripe banana or buttery yellow colour. You can do this by either prolonged gentle heating or wafting the bead in and out of a striking flame. When I worked this glass it was an extremely sunny day and I noticed the bead was sparkling as I was working it. After firing the beads and checking them again under a lamp there is a very light sparkle noticeable under bright direct light. This explains the graininess in the rod, probably due to tiny reflective inclusions in this glass. The sparkle is not very noticeable unless you’re really looking at the bead. Although you can spot the sparkle more easily if you dot pale transparent glass over Banana Special Odd, as the sparkle is pushed to the outer edge of the clear dot to form a sparkly ring (this is impossible to photograph) around the dot. The sparkle is similar to Vetrofond Yellow Pineapple Sparkle Odd (which is a transparent glass), except because it is in an opaque glass, much harder to see. The long thin bead and the bubble dot bead next to it are both made with Vetrofond Banana Special Odd. 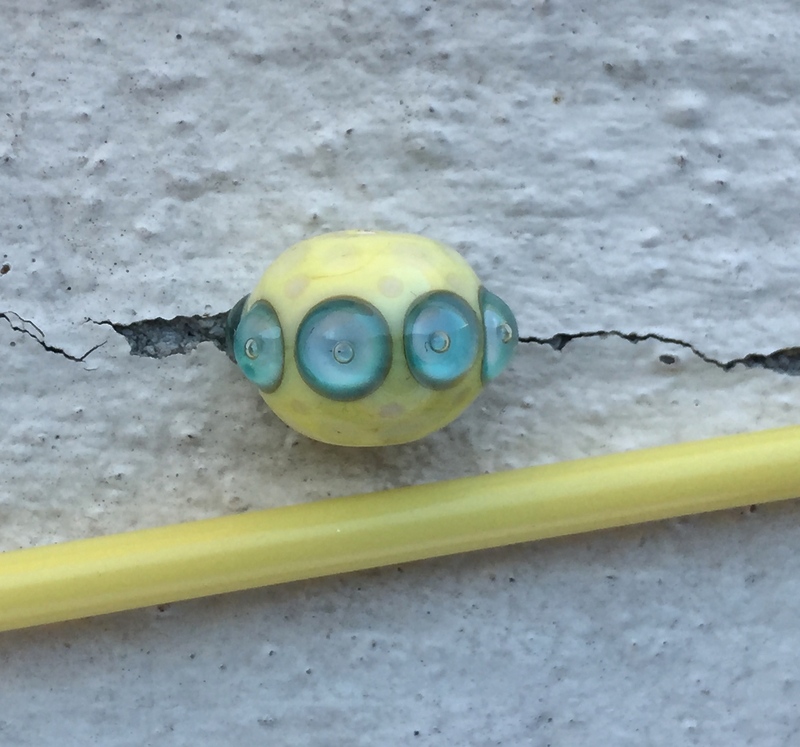 The bead at the bottom with the circle of Celadon dots around the hole is Effetre Opal Yellow, notice how there is no reaction line between Celadon and Opal Yellow. Banana Special Odd is a great pastel yellow that works so well with CiM Celadon (if you don’t mind the dark brown reaction line between the two colours) and CiM Ginger (no reaction). I have a feeling that Banana Special Odd is one of those colours that will always develop a reaction line between itself and anything containing copper – so blue and green opaque glass. There was a period of time where nearly every Vetrofond yellow colour produced did this reaction line thing. If you don’t want the reaction line, lay down a thin layer of clear first. Banana Special Odd does curdle, but I wasn’t paying attention to how I got the reaction, so I think it happens when a section is superheated and left to cool quickly, then reheated. It will get “scorch” marks (greyish burn marks) when worked too hot and too low in the flame, for best results keep it mid range. From left to right, spacer not etched, etched hollow and layered with Reichenbach Raku and encased with Effetre Superclear. The etching brings out some light striations of pale yellow and the encasing lightens Vetrofond Banana Special Odd. Some old notes I found printed off from Frantz Art Glass suggest that all of these Vetrofond yellow “odd” colours require a footprint of clear first, then the colour before encasing. Which is a good tip to stop some glass from cracking under encasement. I didn’t encase this colour completely, so I didn’t bother to put a footprint down first. I think as a general rule of thumb, most yellow and orange glass should have a footprint down before deep encasing. Banana Special Odd looks best when used as a base bead or as big dots, such as flower petals. Pulling it to stringer washes the colour out too much. It plays nicely with opaque Thompson Enamels. Interestingly some opaque enamels didn’t spread out when heated in and some created a blotched effect, a bit like watercolours. Intense black goes webbing crazy over it, much the same effect that it has on Effetre Opal Yellow. The difference in reactions with silver leaf between Effetre Opal Yellow (bottom round bead) and Vetrofond Banana Special Odd. Opal yellow has a pale silvery grey reaction with silver leaf and Banana Special has a very strong red brown reaction which reduces to a mottle greenish blue metallic. I love what happens when fine silver wire is used with Banana Special Odd, a reddish-brown reaction line appears when the wire melts through. The red reaction is replicated with silver leaf. For the testing, I cooked the beads as much as I could, but to keep the red brown reaction, only gently heat fine silver leaf into the bead. When silver leaf on Banana Special Odd is overcooked it turns a steel grey colour that can be reduced to a dark mottled sheen, which is really very attractive for organic designs. At first I thought the closest colour in my stash to Banana Special Odd was Vetrofond Lemon Meringue, but that’s too lemon toned. I then thought it was closer to Effetre Opal Yellow, but that’s a bit on the brownish yellow side when struck. 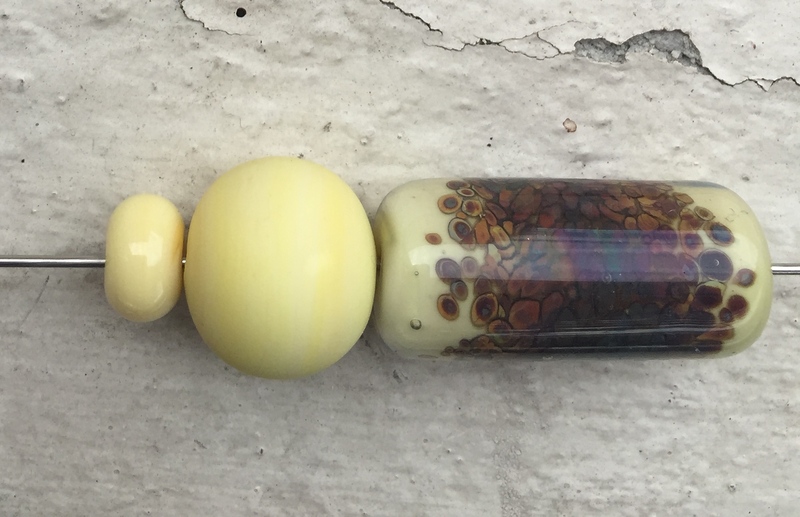 I’ve made some beads up in Effetre Opal Yellow to compare (check the photos). When Opal Yellow is struck gently, it is paler than Banana Special Odd. Although, if you want this particular soft pastel shade of yellow, Banana Special is the go. I always found Opal Yellow way too annoying to use to get a soft yellow colour happening. Note: My Opal Yellow dates back to 2006, so I have no idea if the newer batches are as painful to work with as my batch. The reaction to silver between Opal Yellow and Banana Special Odd is very different. Likewise, transparent glass really spreads out easily over Banana Special, but not as easily over Opal Yellow. The left and centre bead are Vetrofond Banana Special Odd, the middle bead is not struck. The end bead is Effetre Opal Yellow. A Banana Special Odd rod placed below for comparison. Thompson enamels didn’t really bleed into Banana Special, but on the Opal Yellow some have bled to create a water colour effect. This glass is a delicious non-streaky, pastel colour that is less finicky than Effetre Opal Yellow and has a great reaction with fine silver. This makes it a perfect base colour for soft romantic colour palettes. It is a great colour to work with for organic designs when silver leaf is burned in on top and it suits an autumn or spring colour palette (CiM colours work well with it). Whilst VF Banana Cream is still available (it is definitely available from Frantz art glass in rod and stringer form) I would get your hands on some of it on the off chance that it is like my variant and it turns out to be this gorgeous and very versatile soft yellow pastel glass. I think after mucking about with this colour for the last week, I will be using yellow in my designs a whole lot more from now on. Edit: 17.10.15 Two Batches of Banana Cream Compared. I purchased some of Frantz’s stock of VF Banana Cream this year to compare to my older batch and there is a marked variation in the rods in both colour and texture. VF Banana Special Odd is slightly grainy in rod form. The VF Banana Cream that is in stock at Frantz right now is not the same as the colour test here. 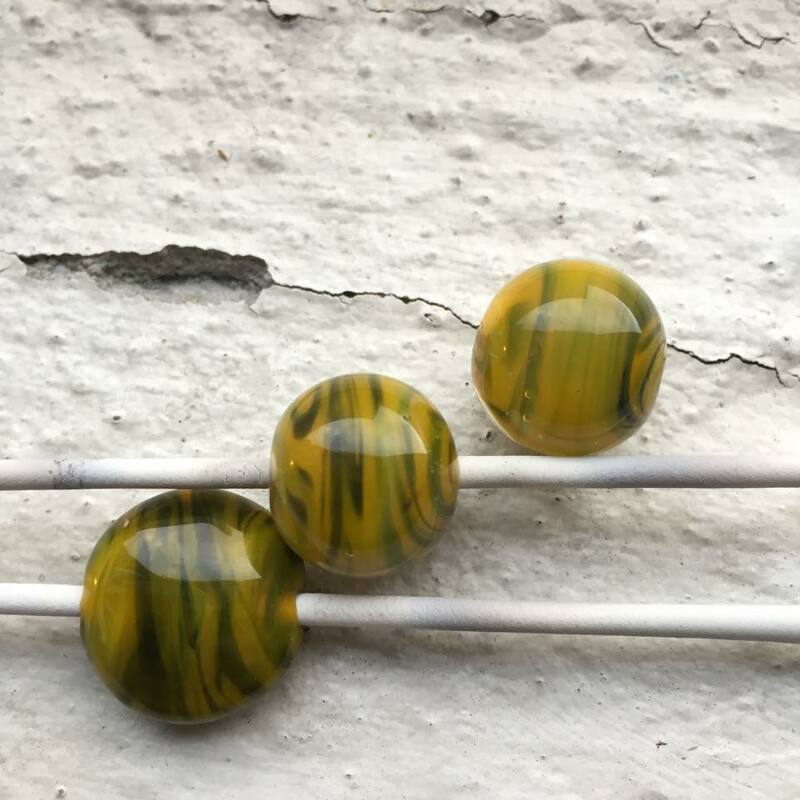 The rods are a different shade of yellow and are smooth to the touch, and also have that streakiness to the glass when melted as well as getting darker. I think its absolutely fascinating that the passage of time and variation of batches have invented a colour that doesn’t seem to have a record anywhere. Sadly, Vetrofond no longer produces soft glass and the recipe for this colour is probably lost. Vetrofond Strawberry Sweet Oddlot, the glass has been used as surface decoration on a base of Effetre Avocado (machine pulled) and Light Ivory and Effetre White and Avocado. Vetrofond Strawberry Sweet is an oddlot glass, which is no longer produced. I don’t know how I did it, but I have almost three pounds of this colour. The rods are an opaque ruddy pink, with a core of lime yellow glass. This means the rods will melt into a mix which can lightly streak, depending on how much heat used. The rods are very smooth to the touch and melt easily. This glass will ping or crack if you do not pre-warm the rod in the top of your flame properly. It is fairly forgiving but shoving it straight into the flame will certainly cause issues. The picture of the rods below look very pink, which is not usually how Strawberry Sweet looks in rod form but it does look better in natural sunlight. I couldn’t get Strawberry Sweet to scum or burn. Strawberry Sweet is a striking colour, so it looks brighter than the rod colour when it has been fully struck. 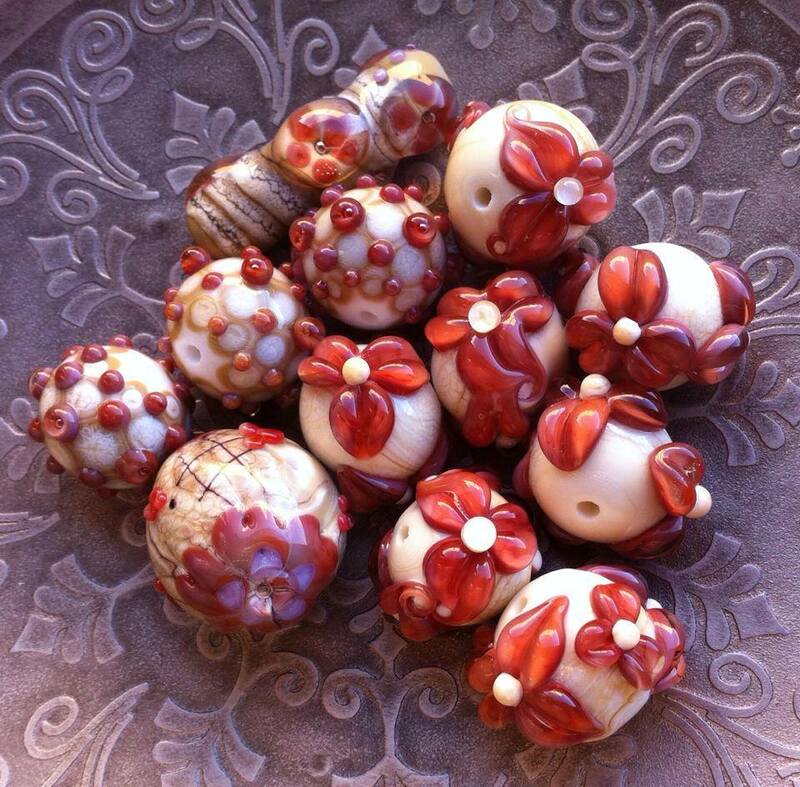 Fully struck Strawberry Sweet without a clear encasement over the top looks brownish when made into an opaque bead. Fully struck and used as surface decoration only (pulled into stringers and small dots) Strawberry sweet looks like the colour of very ripe strawberries. So it’s a good name for it. 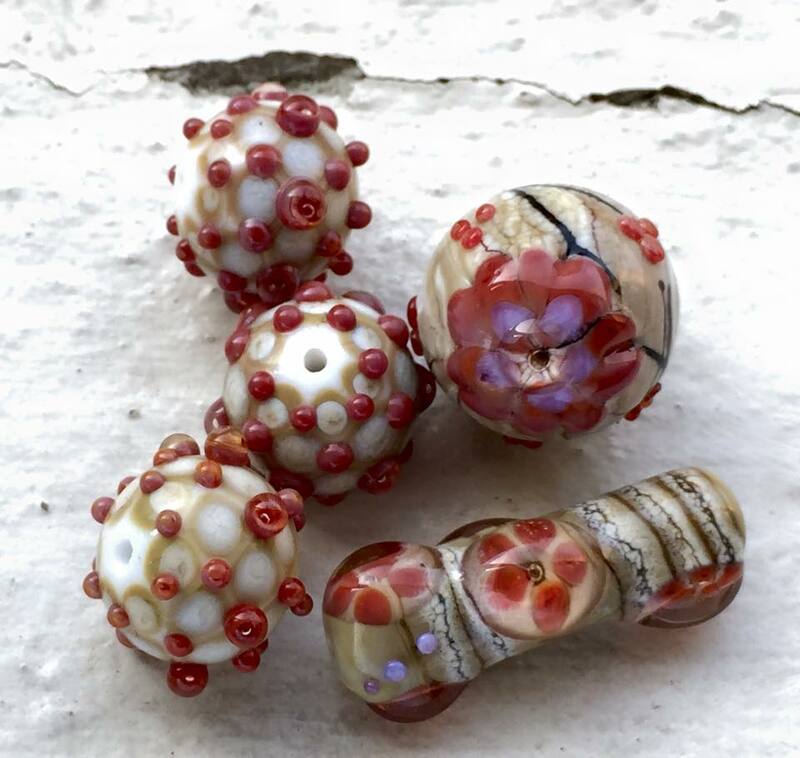 Strawberry Sweet is very easy to strike and you can strike it as you would any other red or yellow striking glass. Just waft your Strawberry Sweet through a propane rich flame and let the colour bloom before pulling into stringers, or after you have finished surface decoration. My personal favourite is to encase Strawberry Sweet in very hot clear glass and watch the colour bloom into a vibrant pink red, such as in the pictures. I have not noticed any kiln striking with this colour, so it does have to be struck in the flame. Vetrofond Strawberry Sweet when encased, colour shifts. It can look much paler in fluorescent light and much richer in hue in sunlight. This colour shifting adds depth to designing flowers, as petals have a much more dimensional appearance. It didn’t spread over Effetre Ivory unless it was really heated up to white hot. I saw a small frazzling and fading of the colour when this was done. Unless you’re going for that particular look, I wouldn’t overheat Strawberry Sweet because you can burn out the colour. Vetrofond Frogpond is an oddlot glass, which is no longer produced. 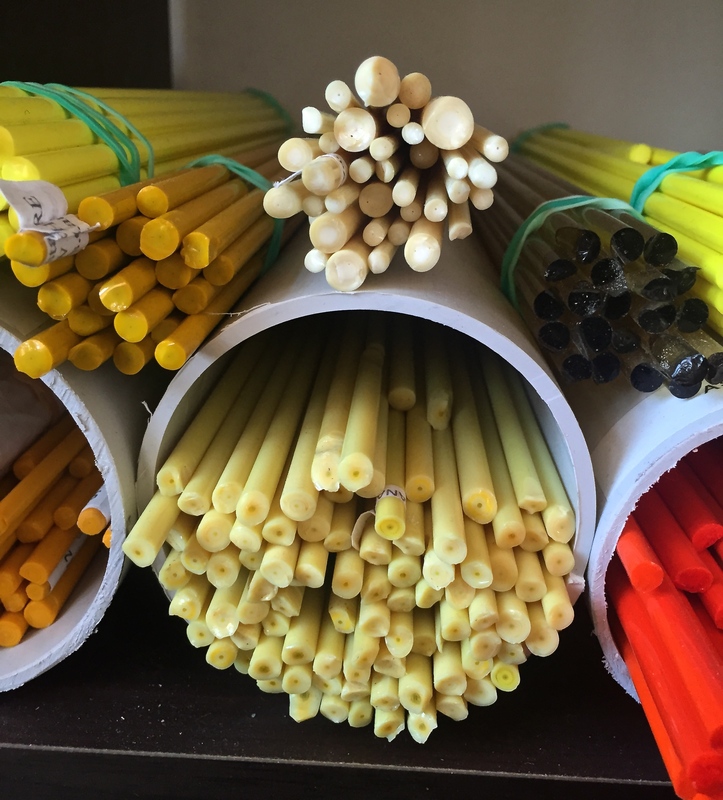 The rods are translucent corn yellow with a core of opaque dark blue almost black glass. This means the rods will blend into a streaky mix of these two colours. The rods are very smooth to the touch and melt easily. They do not shock if pre-warmed at the top of your flame first. Although, I couldn’t get Frogpond to shock, scum or burn out. It is very stable and easy to use. Frogpond has a few secrets. On your first melt the yellow glass will become transparent and the blue black core will be very intense, as you can see in the little bead. If you stop here and don’t give the glass any more heat it will stay like this. If you want the yellow to bloom and the blue black bands to fade a little, you will need to heat the glass a lot more. I worked this glass in a neutral flame until it got white hot and drippy. This is the trick to getting the brightest and most intense yellow. The more heat you give Frogpond, the more pronounced the yellow becomes. 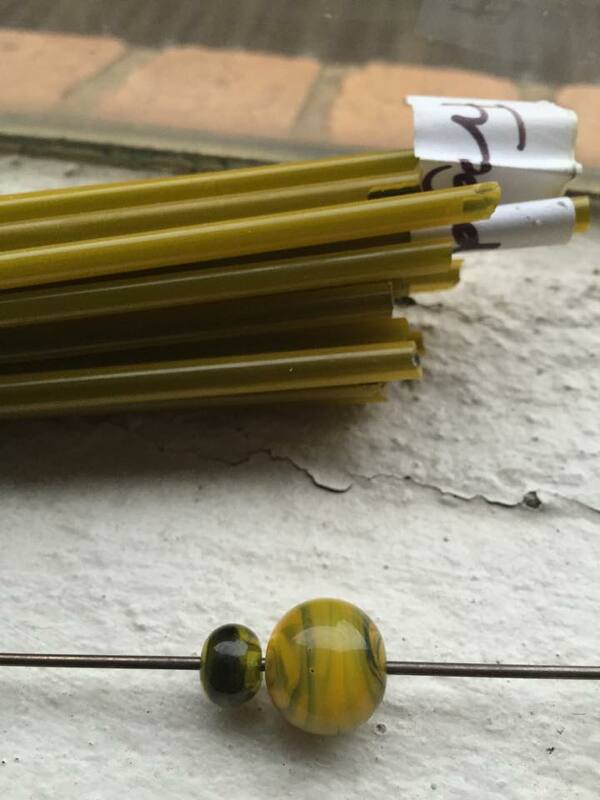 The colour will move from corn to lemon and from transparent to an ethereal translucent glass, where you can see through the depth of the bead as you heat. The blue black core glass seems to float through the yellow glass like smoke with prolonged heat saturation. You can use heat and encasement to control how much yellow and how much black shows in your bead when using Vetrofond Frogpond. In the picture to the right, from top to bottom; the top bead was given the most heat. The glass was melted in a neutral flame until white hot and drippy then gravity shaped into a bead. 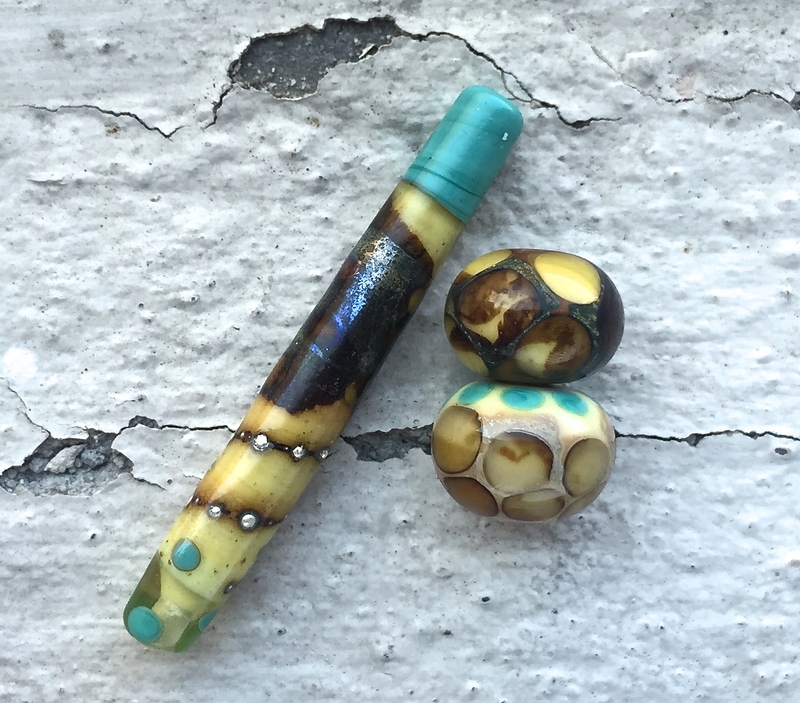 This bead has the most “foggy” translucency out of all three beads. It particularly developed in the centre of the bead where the most heat was concentrated. The second bead was gently heated, it never got drippy or white hot. When it had cooled it was encased with Effetre Clear. Then the entire bead was heated until glowing. Surprisingly, you can’t tell that this bead has an encasement. It looks almost the same as the top bead, you can only tell it has been encased when you look at the holes. 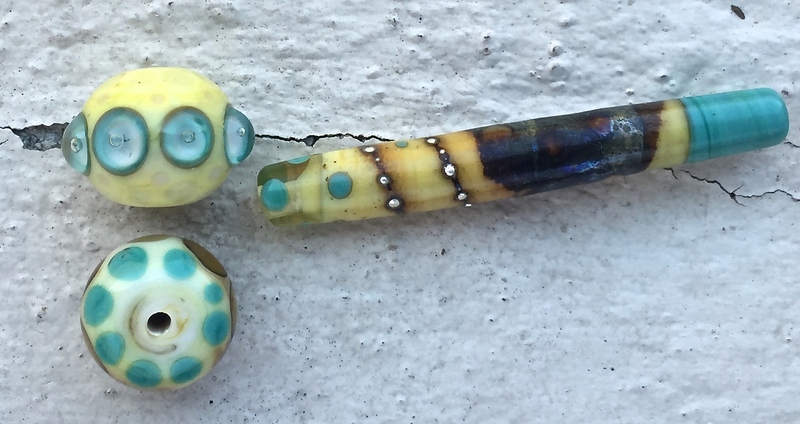 I think what this second bead shows is that when Frogpond is encased, the yellow glass does not react any further. There was some reaction between the Frogpond and the clear encasement, patches of yellow fog showed here and there under the encasement, but in other places on the bead the glass is more transparent. Lastly, the lentil bead was worked higher up in the flame and melted more slowly. It was pressed in a Cattwalk Graduated Lentil press and gently reheated and pressed a few more times to get the nice crisp lentil shape. As you can see in the lentil bead, the yellow glass has kept a lot of it’s transparent corn colour, instead of the more opaque lemon tone. So if you want more black, work cool and slow and don’t overheat. Frogpond holds a lot of heat deep inside the bead whilst the surface can harden quickly. I held the bead out of the flame for a long while to see the colours develop and thought it would shock when reintroduced, but it didn’t. So it’s a very forgiving glass. I think this colour is beautiful and would make a lovely base for floral beads and would be interesting to use in vine stringer. I do need to test it a little further to see how reactive it is (and I will update this post when I do). I hope this post inspires you to use your stash of Vetrofond Frogpond.